Castalia House is dedicated to the revival of classic science fiction and fantasy. The second book in the Castalia House Classics line is the 1958 novel First on the Moon, by Jeff Sutton. Written by a man who was very well-informed about the U.S. space program, it is an exciting tale of what might have happened if the Cold War rivalry between the U.S.A. and the Soviet Union had not only been extended to the space race, but turned hot outside the limits of Earth’s atmosphere. 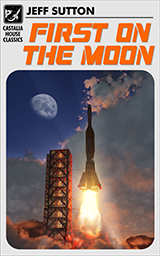 First on the Moon begins with Earthbound intrigue, as pilot Adam Crag learns that one of the other candidates to fly the USA’s first prospective Moon lander has been murdered, presumably by agents of the Soviet Union, who are actively preparing a Moon shot of their own. From the moment Crag is selected, deadly complications plague the mission, including the possibility that one of the three crew members is a sleeper agent for the other side. Part space exploration, part military science fiction, First on the Moon is a true science fiction classic of the Space Age that should not be missed by any science fiction fan. JEAN AND JEFF SUTTON were a man-and-wife writing team who made their home in San Diego, California. This was their second novel as co-authors. Jeff Sutton is also the author of Apollo at Go and Beyond Apollo, both science fiction. An ex-newspaperman and the author of many novels, Mr. Sutton was an editorial consultant in the aerospace field. Mrs. Sutton taught high school social studies in San Diego, California. EPUB format. No DRM. 170 pages. Available only at Castalia House. That cover is simply astonishing. If it has an imperfection as it relates to the story, I’m far too imperfect to recognize it.